Select a full line of decorative accents and trim pieces that capture the detail and look of fine woodwork we call Decorative Trim. From our Half-Round shingles, molded from hand-selected cedar, to our crown moldings for windows and doors, each piece has been created to enhance the look of your home. 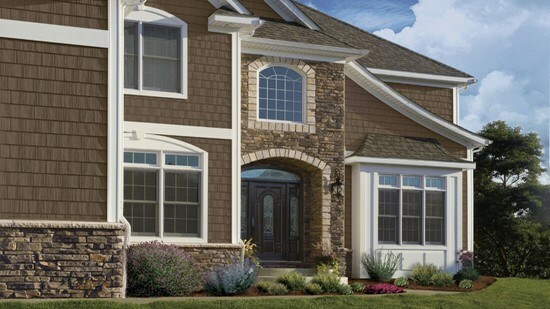 Ideal for whole house or accent applications, Cedar Impressions Double 7” Staggered Perfection Shingles create a warm, friendly look that is at the same time ruggedly beautiful. 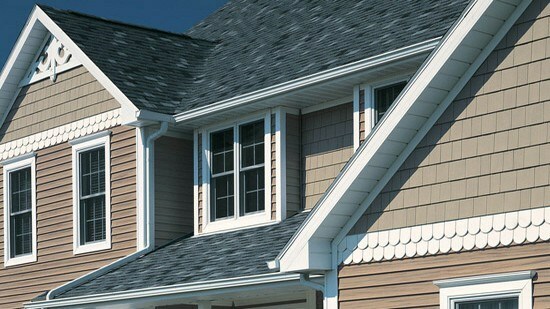 Shown here with Cedar Impressions Half-Rounds in the gables and Monogram Double 4” Clapboard as the main siding panel. 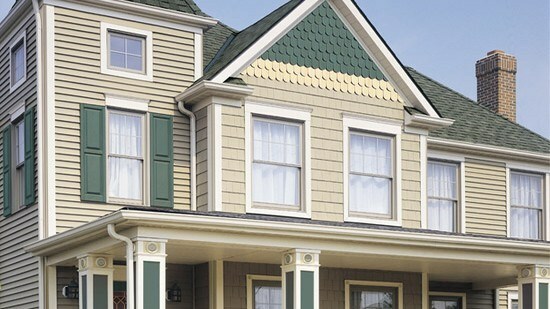 Northwoods can be combined with other CertainTeed siding styles, textures and shapes — an ideal option for full house applications or creating accent areas that highlight special architectural features. Choose from a diverse palette, including darker hues, to add interest and personality by contrasting colors. 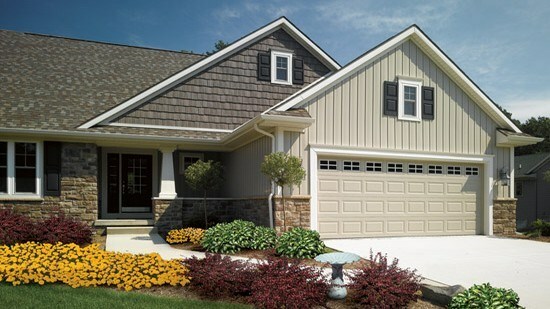 Inspired by nature, CedarBoards™ Insulated Siding is all about beauty and performance. Outside you appreciate the authentic look and texture of natural wood, enhanced by distinctive colors and its straight even face. Inside, you'll enjoy a quieter, more comfortable home. CedarBoards XL panels are designed for special areas of the home where a continuous-panel appearance is preferred. The extra length of CedarBoards XL can significantly reduce seams for a smoother, more continuous look. The difference is seamlessly clear! The innovative foam backing reduces exterior noise, enhancing interior acoustics. CedarBoards™ integral foam increases your home’s energy efficiency, providing an extra measure of comfort for your interior spaces. 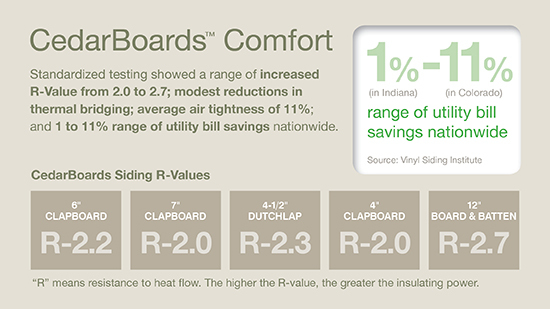 CedarBoards™ can also increase the overall thermal performance of your home, helping to reduce annual heating and cooling costs. 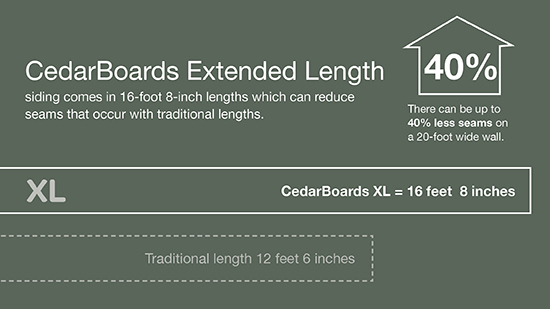 CedarBoards™ Extended Length siding comes in 16-foot 8-inch lengths which can reduce seams that occur with traditional lengths. There can be up to 40% less seams if you use CedarBoard’s extended length panel on a 20-foot wide wall. Available in Double 6” and Single 7” clapboard profiles.